Food is a major part of most cultures around the world, with unique ingredients only found in certain areas helping to define the people that come from that region. Since food differs greatly from country to country, it is to be expected that the pizza we enjoy in America is far different from the pies found in other regions of the world. While pepperoni and sausage are great, these unique toppings from around the globe will create a pizza experience that you’ve likely never seen (or tasted) before. Here are some of the strangest pizza toppings from around the world. Fried eggs can commonly be found on breakfast plates and gourmet burgers in the US, but in France, they can be seen alongside black olives and mushrooms on the topping list at local pizzerias. 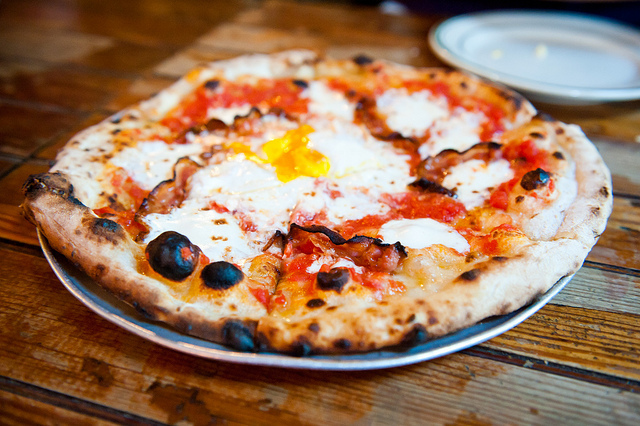 With a runny yolk that soaks into the crust, fried eggs can either be baked directly on top of the pie or fried in a pan and added to the pizza after baking. In a land where it’s completely normal to eat thin crust pizza with a knife and fork, it’s no wonder the Swedish have strange toppings on their pies. One of the most bizarre toppings that can be found on pizzas in Sweden is a pie loaded with curry powder. These spicy pies can pack quite the punch, which is why many curry pizzas also contain pineapple to help curb the burn. While American pizzas don’t get much fishier than anchovies, Germans like their pies full of seafood. Canned tuna is one of the most popular toppings on pizzas found in Germany, providing protein and strange smells to pizza boxes across the country. Since pickles and grapes on a pizza aren’t enough to make our list, New Zealanders complete their strange topping trio with port wine on their pies. With a sweet taste that is rarely found on American pizzas, this New Zealand treat can eliminate hunger, satisfy your sweet tooth and get you a little tipsy. Since one weird topping isn’t enough, the Japanese have taken toppings to a new level with the mayo jaga. Topped with mayonnaise, potatoes, corn, bacon, pimento and onion, this monstrosity of a pie features enough toppings for multiple meals piled high on one pizza. Whether slathering on the sausage or topping pies with tuna, toppings are only part of what makes a great pizza. If you are hungry and looking for the best downtown pizza in Las Vegas, give us a call today at (702) 366-0049.